What was she musing? Of Fairy Garden: This Fairy Path, of Garden lawn – this Fairy border, a Garden bed. Of Fairy Portal: This Fairy Ring, of Darkened grass – this Fairy frame, a Changing Bloom. Of Fairy Lore: This Fairy Tree, of Ancient root – this Fairy stool, a Magic power. Of Fairy Maze: This Fairy Quest, of Prickled bush – this Fairy light, a Labyrinth guide. What did you dream? Of running through the Maze this Night. Seeking for a Guiding Light. Of dancing through the Moon this Night. Peeking for a Branch so Right. Of skipping through the Vines this Night. Looking for a Dress so White. Of Turning through the Night this Night. Thinking of a Heart so Bright. Dressed in White, with Shapely Curve – this Fairy Power, of Angel’s Dream. What did she say? I’ll test your Soul. I’ll test your Strength. Sitting on this, Holly Leaf. I’ll test your Love. I’ll test your Heart. Sitting on this, Ivy Tree. I’ll test your Spirit. I’ll test your Patience. Sitting on this, Clover in Green. I’ll test your Self. I’ll test your Love. Sitting on this, Cherry in Red. What happened next? Embracing of the One for me. The parting of the Ivy. Holding of the One for me. The riding of the Holly. Guiding of the One for me. The climbing of the Ivy. Settling of the One for me. The rooting of the Holly. Dressed in White, with Bluish Eyes – this Fairy Ring, of Angel’s Song. 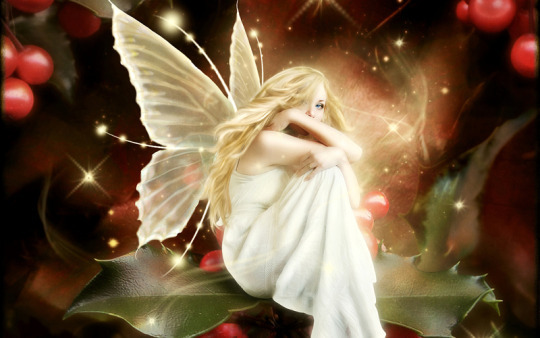 This entry was posted in Fantasy Fairy Art and tagged fairies, fairy, fairy dreams, fairy garden, fairy glamour, fairy portal, fantasy, flower fairy, garden fairy. Bookmark the permalink.